VS Mahjong Otome Ryouran © 1998 Electro Design. A joystick-controlled mahjong game with selectable characters and anime sequences. Released in July 1998 in Japan. 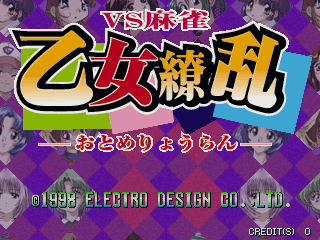 The title of this game translates from Japanese as 'VS Mahjong Blooming Virgins'. This game features models from the game "Gals Panic S2".